Cycle Ladies and Gents of Bike Commuters, please give a warm welcome to our newest staff writer and lady commuter… Emily Shellabarger (a.k.a. Shelly, to Mir.I.Am) commuting in the Bay Area, California! 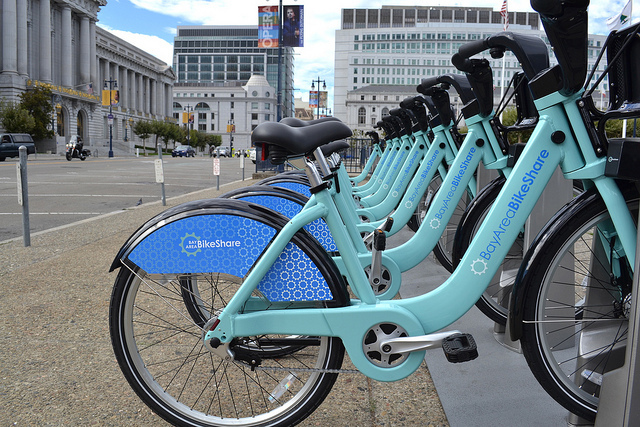 While Emily warms up her fingertips for some intense keyboard-slamming action for 2014, here’s a little guest post to give you a taste of the new bike share program in the Bay Area. San Franciscans have watched enviously as bike share programs started cropping up in other metropolitan areas from New York to Washington DC, London to Paris. 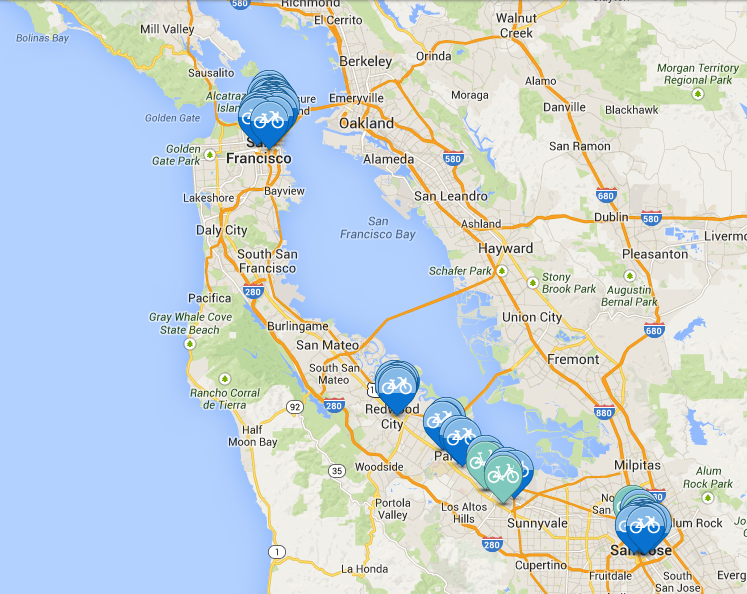 Finally, our turn came this summer with the much anticipated launch of the Bay Area Bike Share program. The network of bikes and docking stations spans the peninsula from San Francisco to San Jose, spattering a handful of cities between the two “San” bookends. Personally, I was stoked to see the chunky, seafoam green bikes arrive in San Francisco––in particular, the double rack right next to the 4th & King street train station, which I visit daily on my commute down the peninsula. The docking racks have been strategically planted near various CalTrain stops to facilitate the last leg of a car-less commute, including my stop in Redwood City. I thought, “I must be the target user!” and wasted no time formulating my shared-bike commute plans. 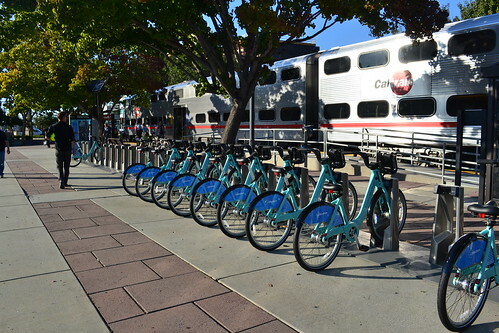 Bay Area Bike Share at the Caltrain Station in Redwood City… Look at them, so SEAFOAMY! With further investigation I discovered both my homebase in the foggy city and my nine-to-five destination are not in the Bike Share network! Oh-so-close, but not close enough. 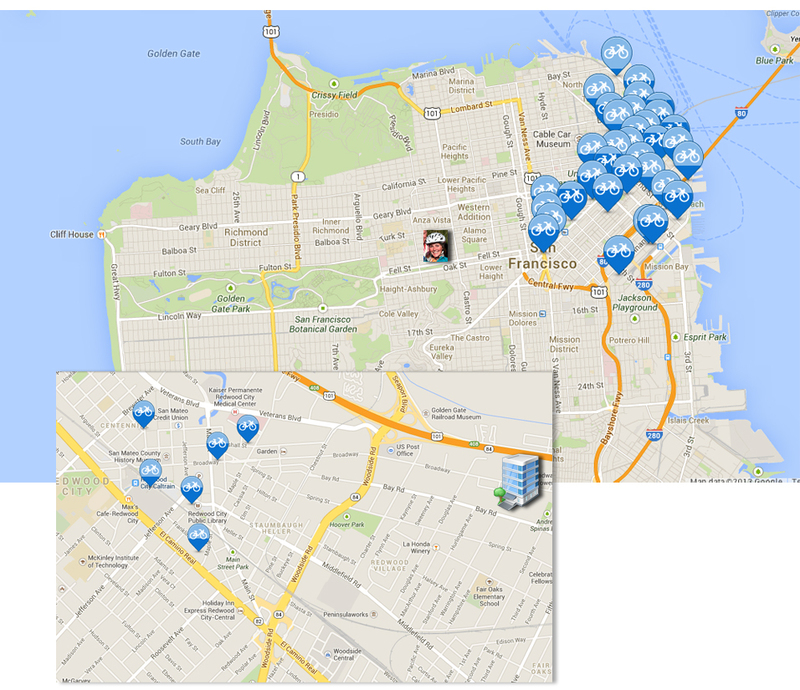 The bike coverage is fairly limited both in San Francisco and the peninsula outlets. However, if you’re looking to ride within a confined radius or run a quick out-and-back errand, the shared bike option will do you just fine. See the little Shelly on the map? Now how to get that Shelly down to the little building in the Peninsula, without bike hauling on and off the Caltrain… Bay Area Bike Share = sadly, almost there. Currently, the San Francisco peninsula geographic expanse is served by only 70 sations with 700 bikes––doesn’t seem like enough, especially considering 35 of those stations are in San Francisco alone. Luckily, the program will bump up to 100 stations with 1,000 bikes this coming year, adding more stations in San Francisco’s most bikeable neighborhoods and a few more peninsula cities. My neighborhood isn’t on the list yet, but the neighborhood expansion is a start. For now, I’ll have to stick with hauling my bike on and off the CalTrain and save the shared bikes for special trips. Errrrrckkkkk. (Squeaky brake sound.) So close, but not enough stations yet to merit leaving Stallion behind. Well, it sounds like everyone has to start somewhere, let’s hope the Bay Area Bike Share is responsive to user feedback, so we can all high-five for another successful bike share on the map. I felt the same way when I visited San Francisco last time… no bikes anywhere near my sister’s place in the Mission, but it makes more sense that the program is targeted towards Peninsula commuters. Any readers out there had a chance to try out the system? Let us know in the comments box, below! I think if I were a daily cyclist, I would just use my own bike and not run the risk of stepping off of the train to find that there were none left for me. Yep… same guys that are behind the Divvy Bikeshare in Chicago. We’re fortunate that Chicago went “all in” and started with 300 stations with 3000 bikes! And it will grow to 400 stations in early 2014… and plans to expand beyond that! Yay!